You are cordially invited to participate in the (Y)our Broomielaw Emerging Ideas Stakeholder Event 02. This follows on from Event 01 in October which helped set the project agenda. 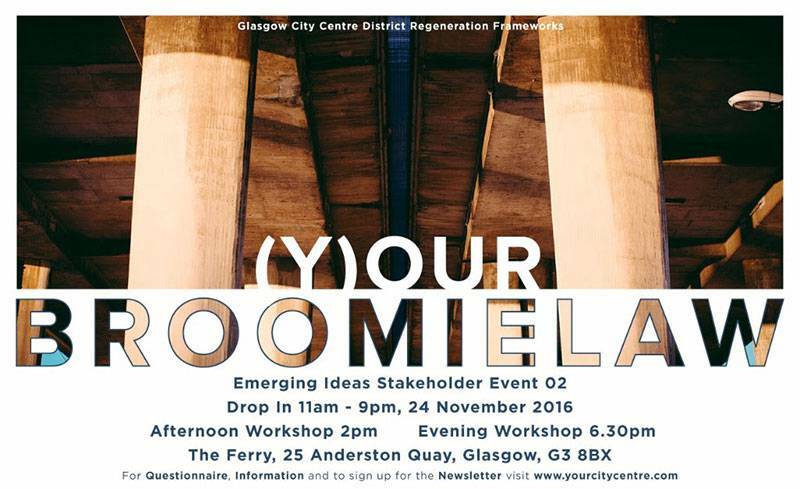 The Emerging Ideas Stakeholder Event 02 on 24 November 2016 will allow you to review initial ideas, help refine proposals and inform a prioritised action plan for a new Broomielaw District Regeneration Framework. Drop in to the Renfrew Ferry at any time from 11:00am till 21:00pm on Thursday 24 November to share your ideas and help shape the regeneration of (Y)our Broomielaw over the next 10 years. Come along to presentations and workshops at 2:00pm and 6.30pm to review and refine the Emerging Ideas. Sign up for the workshops below.